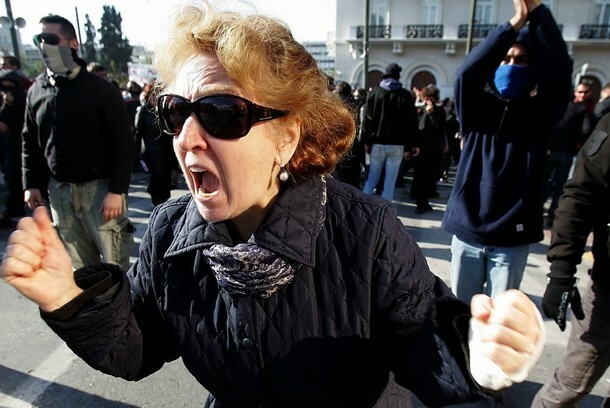 Last December, the wind of insurrection blew over the cities in Greece. The joyful and festive atmosphere of Christmas was set on fire together with the Christmas tree on Syntagma square. The assassination of the 15-year-old student Alexis Grigoropoulos by a special police guard on the 6th ignited the spark. In general, the social unrest of December can be characterized as a violent proletarian rebellion which had a sudden, mass and wild burst that gradually gave way to less violent, more imaginative and more political acts but with fewer people involved. As far as the class composition of the rebellion is concerned, it ranged from high school students and university students to young workers and unemployed. Some of the students and the workers were second-generation immigrants (mostly Albanians, although there were also some immigrants of other nationalities) and there were also some older workers with more or less stable jobs. As for numbers, gradually more and more people participated in actions that took the form of an insurrection. On the first day there were just a few hundreds of antiauthoritarians around Exarchia -the place of the murder- that started the violent confrontations with the cops. Later in the night, a spontaneous demo took place after an initiative of students and leftists – around 2,000 people participated and started riots in Patission and Akadimias Avenues, while one hundred people smashed Ermou st, the most commercial street of Athens. Riots also broke out in the streets of Thessaloniki where a spontaneous demo headed for and attacked the city’s central police station. On the second day more than 10,000 appeared in the streets (mostly students, antiauthoritarians again and people from left parties and organizations); on the third day more than 20,000 in Athens, 7,000 in Thessaloniki and many thousands all over Greece joined demos that were soon turned into riots. Those involved in street fighting with the police were a lot; 10,000 seems to be a rather moderate calculation. There were a lot more all over the country, particularly on Monday, the third day of the riots. On this day, banks, public buildings and mostly big stores were either smashed, looted or burned down. Those involved in the violent acts of this day were not a homogeneous mass: they were a multitude of young people -high school and university students, waged workers, unemployed, immigrants, football hooligans, drug addicts- with only a portion of them having connections with the antiauthoritarian milieu. Precisely because of the motley composition of the multitude and its violence, a lot of politicos (even some organized anarchists) found it too ‘uncontrollable’ and refrained themselves from what happened. From Monday morning and during the next days there were attacks against the police stations all over the country that were mainly made by high school students. Some of those attacks were very violent with police cars being overturned and use of Molotov cocktails (mostly in the west suburbs of Athens and the port of Pireaus) but demonstrating outside the police stations became quite generalized all over Greece, even in some posh areas or small towns, with milder forms of protest. It was actually through the spontaneous violent protests of high school students that the riots spread and thus took nationwide dimensions. When we talk about clashes with cops, we are mostly talking about barricades, throwing stones and molotov cocktails and not physical combats. Generally, not only the rioters, but also the police preferred not to engage in “close-combat” making excessive use of tear gas instead. As for immigrants, second generation young Albanians who took part in the riots are so well integrated into society that only when they started talking albanian to each other you could tell that they were immigrants. Most of them have grown up here and that is the reason why they could take part so extensively in confrontations with cops, in attacks against state buildings and banks and lootings as well alongside greek young proletarians. They felt more ‘comfortable’ doing such acts than other immigrants, mostly Asians and Africans who still live on the fringe, isolated in their ethnic communities. It was mostly fear that prevented other immigrant communities from joining the violent confrontations outside their neighborhoods and not ‘lack of conscience’. It was easier for them to participate in the riots through looting or frequenting the open National Technical University occupation in the centre of Athens where big communities of them live; when the riots erupted near ‘their’ neighborhoods, that was their ‘contribution’ to them. On the other hand, they received the most violent onslaught from both the police and the media propaganda. They were presented as ‘plunderers’ and ‘thieves’ and in some cases there were pogrom style attacks against them by fascists and undercover cops in civilian outfits. In general, you could say that, apart from high school and university students, those who had a more active role in the revolt were generally young workers, most of them having precarious or ‘flexible’ jobs. In the streets there were young (or not so young) workers from various sectors like schools, construction, tourist and entertainment services, transportation, even media. As far as factory workers are concerned, there are not any accurate estimations about their individual participation in the riots, since no reports from such workplaces became known. During the GSEE occupation, there were some ideas about distributing leaflets to factories and calling workers from specific workplaces to come to the occupation, however the splits among the participants (mentioned briefly in our chronology of the events) made any further action -apart from intervening in nearby call centres- difficult and thus several opportunities were missed. Shortly after the immigrant cleaner Kuneva, one of the workers that had visited the occupied GSEE to meet the squatters, was attacked with sulphuric acid, the ‘insurgent workers’ alongside other people organised the first solidarity activities. They even managed to get some unions into solidarity activities in January. The riot, in general, was not felt in any significant way in the workplaces, in the sense that no strikes were called to support it. The only exceptions were the teachers’ strike on the day of the funeral of young Alexis and the big participation in the strike demo against the state budget on the 10th of December. Apart from these, the rebellion left workplaces untouched. Judging from the slogans and the attacks against the police, an overwhelmingly anti-cop sentiment was dominant during the days of the rebellion. The cop stood for power and particularly the brutality and arrogance of power. However, it was as symbols of a certain power - the power of money, the power to impose the exploitation of labour and deepen the class lines separating Greek society- that big stores, banks as well as state buildings (town halls, prefecture buildings, ministries) were attacked, burnt down or occupied. So, we could speak of a dominant and widespread anti-cop, anti-state, anti-capitalist feeling. Even the intellectuals of the left acknowledged the class element of the rebellion and some mainstream newspapers admitted that ‘young people’s rage’ was not expressed only because of police violence. The cops were rather the most visible and crudest tip of an iceberg made of government corruption scandals, a security-surveillance state - armoured after the 2004 Olympics - that does not even hesitate to shoot in cold blood, a continuous attack on wages, an increase of working class reproduction costs through the gradual demolition of the previous pension and health system, a deterioration of work conditions and an increase of precarious jobs and unemployment, a load of overwork imposed on high school and university students, a tremendous destruction of nature, a glamorous facade consisting of abstract objects of desire in malls and on TV ads, obtainable only if you endure a huge amount of exploitation and anxiety. In the first days of the revolt you could almost smell all these reasons in the air and then a lot of texts, articles, leaflets followed, written both by insurgents or sympathizers and ‘commentators’ to acknowledge that there was ‘something deeper’. This ‘deeper thing’ that everybody was talking about was the need to overcome the individual isolation from real, communal life [gemeinwesen], an isolation that all the above historical reasons have created. The spontaneity and uncontrollable nature of this insurrection was proven by the absence of political proposals, thus by an explicit rejection of politics. It was mostly leftists that insisted in particular demands like the resignation of the government, the repeal of the anti-terrorist act, the disarmament of cops and the disbandment of special police forces. However, the feeling that there lay ‘something deeper’ in all that was so dominant that it alone explains the helplessness of some parties of the opposition, leftist organizations, even some anarchists as mentioned before. There were no specific political demands and this, combined with their ferocity, made the riots all too threatening for the usual forces of recuperation and manipulation. From the very first days of the revolt three universities got also occupied in the centre of Athens: the National Technical University of Athens, the Faculty of Law and the Faculty of Economics. Each one of them was occupied by a different tendency in the movement. The National Technical University, which is the nearest one to Exarchia square was the main place for organising clashes with the police. Its occupants were almost a cross-section of the rebels in Athens: young workers (immigrant or Greek), students and marginalised elements –and many of them anarchists. The occupants of the Faculty of Law, mainly leftists and some anti-authoritarians, organized demos and discussions. In one of them, leftist unionists gathered in order to organize and ‘spread the rebellion’ to workplaces, without actually doing anything apart from putting out some flyers. The Faculty of Economics was occupied mostly by anarchist groups and antiauthoritarians who wanted to use the building for counter-information purposes. A lot of emphasis was put on the organization of everyday activities. They took over the restaurant of the university and workshops were formed in order to run the occupation and to organize actions outside. The expropriated resources of the university were also used in other activities, serving as an infrastructure. Many comrades took part in actions organized from there, even if they did not take part in the occupation itself. All occupations served as ‘red bases’ of the movement from which subversive actions were organized and where rebels could seek refuge, if necessary. In Thessaloniki, there were two such occupations in the city center: the School of Drama was occupied by anarchist militants and drama students, while the offices of Thessaloniki’s Bar Association were occupied until the fourth day of the rebellion by students, mainly leftists. We should also mention here the dozens of occupations of university departments voted for by students’ general assemblies and the hundreds of occupations of high schools all over the country. Gradually, the violence of the first days proved to be creative in the sense that it was the necessary presupposition for more imaginative and organized actions that followed. After the first five days of rioting, there was an occupation at the Town Hall of Ag. Dimitrios (a southern suburb of Athens) organized by local anarchist groups and some of the workers working there (predominantly blue collar ones). The occupants organized meetings with local people, called ‘popular assemblies’, trying to broaden the revolt organizing local actions, always connected to the revolt. They even tried to let certain services run in the building without the mediation of the municipal authorities. The next day, an information desk of the Ministry of Interior at Chalandri, a northern suburb of Athens, was occupied and demonstrations and actions always connected with the revolt were organized. In Thessaloniki, in Sykies, a working-class suburb of the city, the Town Hall was partly occupied for a few days, and some days later there followed the occupation of a municipal library in the Ano Poli district of the city of Thessaloniki which served as a place where ‘popular assemblies’ and demonstrations were organized. In all these activities, the common new characteristic was an attempt to ‘open up’ the rebellion towards the neighbourhoods. These assemblies were understood as ‘neighbourhood assemblies of struggle’ or ‘people’s assemblies’, as they were called. In most cases, there appeared distinct tendencies inside this social ‘opening’, particularly as the rebellion was simmering down. One tendency wanted to organize a community of struggle broadening the issues of the rebellion, another one preferred a kind of activity more orientated towards dealing with local matters on a steady basis. In the beginning, the assemblies looked pretty innovative and lively. There was not a formal procedure of decision making or majority rule and initiatives were encouraged. However, by the end of January, the occupations of buildings - whether public, union or municipal ones - did not flourish anymore and it is not clear if there is going to be a new movement coming out of this short-lived practice. Among the ‘population’, or better say the working class as a whole, there was sympathy towards the rioters not only because it was their children fighting and demonstrating out there, but also because they felt that it was a just fight. Particularly the burning of banks was very popular since thousands of people are deep in debt. Looting was not accepted, at last not overtly, because of the strong respect for private property – or, in the case of leftists and some anarchists, for morality reasons. Generally speaking, there was a lot of sympathy and interest for the insurgents but very little active involvement from the part of the ‘population’. From the very first moment after the killing on December 6, state and media mechanisms were activated to confront the explosion of the proletarian rage. Initially, they attempted to put possible reactions under control exploiting the spectacular submission of the resignations by Pavlopoulos and Chinofotis (the Minister and ex-Deputy Minister of the Interior, correspondingly), the Prime Minister’s promise that anybody responsible for the death of the 15-year-old kid will be ‘exemplarily punished’, all oppositional parties’ and many journalists’ disapproval of the government and the ‘discreet stance’ of cops against demonstrators. However, very quickly, they unleashed every form of repression: threats of declaring the country in a state of emergency, mobilization of fascists and para-governmental organizations of ‘indignant citizens’, dozens of arrests and beating of demonstrators, more shootings by cops in Athens. All bosses’ parties in a body (with the Communist Party [KKE] being the most vulgar amongst them) and the TV scamps attempted to spread fear. Similarly, the two major union confederations, GSEE and ADEDY, cancelled the routine strike demonstrations against new year’s state budget when they suspected the danger of those demos being transformed into riots. However, against union bureaucrats’ jabber about government’s failing to ensure social order and peace, demos did take place during the general strike day and were indeed wild. Thus, reality was different: bosses were those who were afraid. When the foreign minister of France stated from the very first days of the insurgency ‘I would like to express our concern, everyone’s concern about the progress of conflicts in Greece’, he would express bosses’ fear for the possibility of this social explosion to be circulated, since solidarity demos to insurgents in Greece were taking place in many cities all over the world. Particularly in France, the Ministry of Education withdrew the impeding reform in secondary schools, thus giving an end to an emerging movement of high school kids applauding the flames of insurgency in Greek cities and towns. On the side of state and media propaganda, the dominant strategy was that of separation of the subjects of the insurrection. They were either presenting the insurgency as an adventure of teenagers, whose inherent sensitivity due to their age gives them a right to rebel against their parents’ world (as if proletarian parents wouldn’t rightfully desire this world’s destruction) or they were mobilizing racist reflexes using the fake separation ‘Greek demonstrators - immigrant looters’. They were mainly attempting to separate demonstrators between good-peaceful ones and bad-rioters. The right of demonstrating was affirmed by bosses and their lackeys only to suppress the insurrection. Because they wanted to avoid any further socialization of violent behaviours in the streets, they sought by all means to present them as actions of ‘antiauthoritarians’ or ‘hooligans’ who intruded into demonstrations of otherwise peace-loving civilians. Smashing as a proletarian action declared the everyday existence of police departments, banks or chain stores as moments of a silent war. It also manifested the rupture with the democratic management of social conflict, which tolerates demos against this or that matter, provided that they are deprived of any autonomous class action. Invoking the ultimate political rampart of capital’s dominance, that is democracy, the prime minister declared that ‘social struggles or the death of a teenager cannot be confused with actions against democracy’. Democracy of course approves devastating cities and the countryside, polluting atmosphere and contaminating water, bombing, selling weapons, creating dumps of human beings, forcing us to stop being humans in order to become objects-that-work (or look for work, since more and more people are or will be unemployed because of the crisis). He thus implicated that some people can destroy anything they want as long as new chances for profit are created and development is promoted. However, doing this against private property constitutes the ultimate scandal for a society which has established this essential right from its early birth. Burning and smashing constitute wounds to this society’s legitimacy. The ‘hooded rioters’ is an empty notion, intended for police use exclusively. Police monopolize the shaping of the threat’s profile. We should add here that since the shooting of a riot-cop in Exarchia on 4 January police repression against demonstrators has escalated. Locals who defend a park in the city of Athens, farmers who intend to drive their tractors to the parliament and demonstrators against the imprisonment of those who have been arrested up till now have been attacked not only with tear gas but with grenades as well. For the image-producing machine, the very opposite of the ‘hooded rioter’ (that is, the image constructed to separate proletarians) was the ‘peaceful civilian whose property was destroyed’. Who was this celebrated ‘peaceful civilian’, enraged by smashing? In this occasion, ‘peaceful civilians’ were the small businessmen, the owners of ‘small’ stores, the petit bourgeoisie. The state has been fooling even them, since many of them are being destroyed by the capitalist crisis. During last December, turnover was half of that of December 2007, not only for streets with expensive stores, but also for open-air markets; yet no such market was attacked during the riots… Bosses claimed that smashing stores had made many people lose their jobs, while at the same time one hundred thousand layoffs are to be announced soon in Greece because of the crisis. However, whatever smashes of ‘small’ stores were not carried out by hooded state servants were commented by workers in such stores in a leaflet written by the ‘Autonomous Initiative of Shop-assistants of Larisa’: ‘We denounce whoever attempts to terrorize and convince us that defending some properties stands above human life and dignity; besides, these properties have been created by precarious workers’ unpaid, black and surplus labour; no small properties have been damaged during symbolic attacks against banks and public buildings [indeed, this is true for Larissa and other provincial cities]. If they really care about shop-assistants, they should increase the miserable wages they give them, they should learn what social security is and they should create human working hours and conditions’. The parties of the left were taken aback by the riots and had a varied attitude towards them. SYRIZA (Coalition of the Radical Left), a coalition of Synaspismos and other minor leftist organizations, kept a balanced attitude towards the rebellion. The top leaders of the party machine did not hesitate to keep their distances from the violence of the rioters, even to denounce them, however, in a moderate way compared to the frenzy of the KKE. On the tremendous night of the 8th of December demonstrators of Syriza abused violent demonstrators without however trying to prevent them. Ordinary members or voters of Syriza were very sympathetic in most cases towards the rebellion although presenting it as a ‘youth explosion’ and consequently as something external to them. Students of Syriza took part in the demos against the police and they had a milder attitude towards them, in most of the cases. KKE, understanding perfectly that it was their very political power as a part of the political system which was at stake, chose to adopt a cop-like attitude resembling more the far-Right, condemning rioters as a whole as ‘provocateurs’, manipulated by domestic and foreign ‘dark centres’. As for leftist parties and organizations and KOE in particular (a member of the SYRIZA coalition), they were in favour of the rebellion as an explosion ‘expected’ by them, but one without ‘positive’ demands. That’s why they were eager to present a list of demands asking the government to resign so that they could exploit politically the change of the political personnel. From the various trotskyist groups some were more active than others and participated in the Faculty of Law occupation and KKE M-L had a rather positive attitude towards the rebellion, abstaining of course from the clashes with the police. In general, leftists, except for few groups, had a rather superficial relation to the rebellion taking mostly part in demos but not in other activities. The strength of fascists in Greece cannot be compared to that of the fascists in Italy during the 70’s. The main neo-nazi organisation (Chrisi Avgi –i.e. Golden Dawn) can count on a few hundred militants all over Greece. There’s also LAOS, a far right populist party which is the fifth party of the Greek parliament with 3,8% of the vote, but it’s hard to calculate its militant basis. Although right-wing militants took part in the repression of the revolt in the cities of Patra (mostly) and Larissa (to a lesser degree), it’s impossible to make a comparison between the situation in Italy and the situation in Greece because fascists in Greece are less organized. It was one of the state’s resort when media propaganda and cop repression were not sufficient but only in Patra they have an organisational basis (one with a long tradition, indeed –Temponeras, a high-school teacher was murdered in one occupied school in Patra in 1991 by the then secretary of the Youth branch of the right wing party, which is now in government). The riots were connected with a particular political subculture, that of anarchists and anti-authoritarians in Greece, who played a very important role during the first two days of the riots and especially the first one. Their immediate violent reaction to the murder triggered off a social explosion that surpassed them and spread all over Greece. Because of the activities of students and other parts of the proletariat who left their own marks on it, the rebellion of December cannot be reduced to the rituals of street-fighting this sub-culture seemed traditionally so keen on and trapped in, as well. Although the rebellion has ended, there are still visible traces of it. Some occupations remain, solidarity to those arrested and the spirit of the rebellion still unites various elements who took part in the insurrection (although certain sectarian and ideological signs appear), new struggles emerge with more radical characteristics and violence against the state seems to be a lot more legitimized. The rise of new organisational forms and contents of struggle is being discussed by all the insurgent elements. Politically, those left parties and organisations that were taken by surprise and stood in awe of the rebellion will not offer much. They are just hoping for new members and seem rather untouched by the rebellion. The unions, both as a form and content of struggle, small or big, remained untouched by the insurrection or even hostile to it. The mainstream parties cannot hide their fear confronted with such powerful gestures of disobedience and attack on all institutions. There are certain signs of a return to the normality of both everyday life and politics as usual but also traces of new alliances and practices which will need time to get a clearer form and content. But unfortunately the imagery doesn't really work (for me, anyway) when reversed - who wants a thousand winters? You go to my head. No, that's right, a winter thousand Decembers sounds horrible! Maybe in Greek it sounds better? maybe in greece december's a little less bleak? especially, I suppose, from now on. I think the reference to the song draws on, not only the insurgents' fury against the cop-capitalist-state, but also the love that animates their fury. The "crazy romance" from the song can be transposed to describe the anarchist communities' loving relations with each other, including Alexis. When he was murdered, the cops who killed him broke the hearts of the anarchists who loved him -- not only of the anarchists who knew him personally but also of all people around the world who shared his revolutionary ideals -- who committed their hearts to projects of creating a joyous, nonauthoritarian, noncapitalist, cop-free world. I think you can read into things more than is really intended. I think TPTG are only doing the same here as they did with the title of another of their texts - 'The rebellious passage of a proletarian minority through a brief period of time'; they're just referring to other texts in the same theoretical tradition that they see themselves as part of - ie, Debord's film 'On the Passage of a Few Persons Through a Rather Brief Period of Time'.